In the future it seems like every device we buy will be connected, enabling us to track and manage what’s going on in our homes and offices wherever we are. But those devices need a platform to easily create applications for them. Electric Imp wants to be that connective tissue that powers all those devices, with a wireless module and cloud-based platform for connecting to them. Electric Imp has raised $15 million in Series B funding from a group of strategic investors that include consumer electronics manufacturing giant Foxconn, along with PTI Ventures and Rampart Capital. The new funding comes on top of about $8 million that Electric Imp raised two years ago from Redpoint Ventures and Lowercase Capital. In addition to its other investors, founder and CEO Hugo Fiennes put some more of his own money in during this round, thanks to a windfall that he received from the sale of Nest to Google. Fiennes, you see, was one of the early team members there before deciding to strike out on his own and build Electric Imp. “I found myself flush with Google cash after the Nest acquisition. I’m slightly sad that I didn’t stay because then I’d never have to work again,” Fiennes told me. That said, he sees a much larger opportunity for Electric Imp. “Personally I believe the market Imp is addressing is huger than what Nest could address,” he said. Today, Electric Imp chips are embedded in about half a million connected devices around the world. But considering the gazillions of gadgets that are sold each year, the company has a long way to go before becoming ubiquitous. A strategic partnership with Foxconn should help it get more adoption, along with some other partnerships that Electric Imp has signed but is not quite ready to announce. It will also be helped through a partnership with wireless chipmaker Murata announced earlier this year. Through that agreement, Murata has designed an integrated Imp module at about 1/10 the size of its first-generation model. 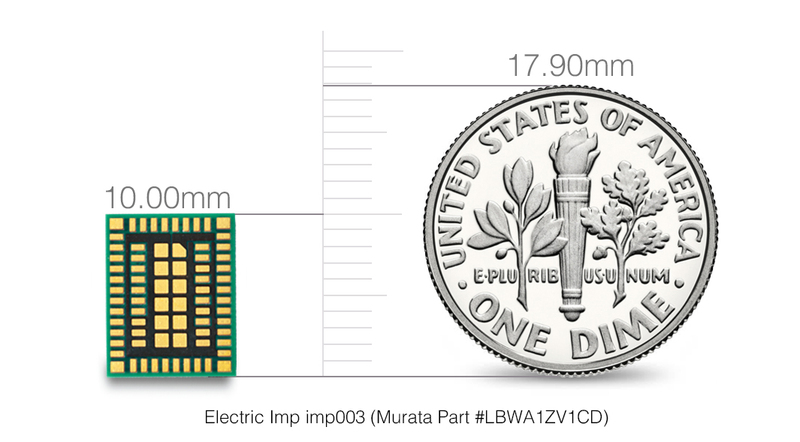 Murata will also be selling the module to hardware developers, which makes life a bit easier for Electric Imp. Without having to worry about selling and providing the units itself, the company can focus on what it does best, which is providing the backend technology that controls connected devices using its platform. On the consumer side of things, there’s a whole lot of devices that will probably become smart — or at least “connected” — over the coming years. That includes everything from dishwashers and washing machines to smart refrigerators and ovens. So there’s a growing addressable market to serve so-called white goods. That’s something that it’s looking to address through partnerships with the likes of GE and Quirky to enable makers to build devices that can be managed through its platform. Electric Imp’s tech could also be used for enterprise and industrial applications like asset management, HVAC, energy management, and manufacturing. One example of this was a partnership with clean energy company Bonded Energy Solutions, which used Imp technology to reduce energy usage in six residential buildings by at least 15 percent. As a result, it’s not that big of a surprise that the company has secured the new funding, and that it decided to take money from Foxconn as part of that funding. With its partnerships in place and funding closed, it could begin providing the connective tissue behind a lot more of the devices we use every day.